This time two years ago you could not turn on daytime TV without being inundated with online bingo TV adverts and seeing bingo site ‘bumpers’ wrapped around your favourite shows such as Jeremy Kyle, Loose Women, Tipping Point and Emmerdale to name just a few. Tune in at the same time now to the same programmes and the landscape is very different. You used to see all the big names in online bingo during the day – Jackpotjoy, Gala Bingo, Wink Bingo, tombola, Dream Bingo and William Hill Bingo to name just a few. Now, due to changes in rules and regulations regarding what can and can’t be said in the adverts between certain times, there are only a few left that are willing or even able to keep producing adverts to meet these requirements. The biggest change has seen online bingo sites and other gaming sites being prohibited from mentioning any kind of welcome offer before the 9pm watershed. This means that while bingo sites can tell you about their latest game or prize giveaway, they cannot tell you what you will receive if you sign up with them as a new player in order to take part in that promotion. For Your Information: The offers contained within these adverts may have expired, these are legacy TV ads showing a history of bingo brands that advertised on telly. Sun Bingo made a huge impact with their ‘Are You Gonna Bingo?’ campaign in 2018, picking up the Best Online Bingo TV Advert at the 2018 WhichBingo Awards. The advert is a parody of the grime classic ‘Are You Gonna Bang Doe?’ by Funkee Dee and stars comedienne Jayde Adams. Jackpotjoy is about the biggest operator that has disappeared completely from our TV screens. Barbara Windsor as the Queen of Bingo seems to have been retired. The company is concentrating its efforts in limited digital advertising, but is also keen to retain and reactivate existing members directly. The site still runs loads of offers, but is using its in-house ‘Chat-o-Vision’ service using chat hosts to engage players and get them to stay and play and to recommend the site to their friends. Gala Bingo is one of the few sites that remains active in TV advertising, with a new ad appearing roughly every couple of months. In the past they used to change their ads monthly to mark their latest offer. In August 2017 Gala Bingo were giving away a holiday every day and adapted their ‘Play Happy’ TV ads featuring people exploring the virtual world of the bingo site in a golf buggy to focus on how to take part and what you could win. If you do catch a bingo TV advert now you will notice that they bear absolutely no resemblance to the stereotyped adverts that we were seeing pushed out time and time again from the advertising agencies who had one image of online bingo in their minds. Of all the online bingo sites it was probably tombola that was the first to move away from this stereotyping of bingo players by using real players in fun situations to focus on the social aspect of playing bingo online. They invite real players to apply, hold a casting session and then the lucky few are invited to shoot the TV adverts over a fun filled week. We know they are fun-filled because we’ve been there and taken part! Even tombola moved with the times though and for a year abandoned their player focused ads in favour of ad agency recommendations which once again saw people in contrived situations accessing bingo on their mobile devices before going back to the popular player focused versions. You will still find tombola adverts popping up on your screens as they are one of the few that continue to invest in this form of marketing. They have never been ones to give away loads of bonuses and instead rely on the quality of the games themselves and player recommendations to keep the business growing. Wink Bingo is another online bingo site you will still see occasionally on the TV. Their ads have been among the most memorable over the years. There has been an Irish dancing dog, young and old people bopping along to the D.I.S.C.O pop song. More recently some less inventive ads from Wink Bingo see a young women walking around and people of different ages throwing bingo balls at each other or juggling with them. Some bingo sites decided to go completely ‘off the wall’ with their advertising and the site that springs immediately to mind is Winner Bingo. When that brand first launched they brought us the big girly dancing along the bus stop queue when she won a game of bingo on her mobile phone and that is an image that really is once seen, never forgotten – which is always a good thing for a brand. While these bingo TV adverts may seem weird they have made it easier for the brands that have persevered with TV advertising to adapt to life without being able to rely on huge welcome bonuses as the attraction to joining a site. In mid-2017 this became even more important. On 1st August 2017 bingo and gaming sites became liable for tax on bonus money sloshing about in their accounts that could generate real money winnings at some point for players once wagering was completed. This means that lots of no deposit bonus offers disappeared altogether and the actual first deposit bonuses on offer became much smaller in many instances. The disappearance of many brands from TV in 2017 was probably a direct result of a ‘wait and see’ mentality as the industry kept a watchful eye on the competition to see what the new direction might be. At the time of writing (August 2017) there is still no clear cut strategy evident as to what form a standard welcome offer will take from the biggest or the smallest bingo sites. However, given the cost involved of producing a TV advert in the first place, paying for effective slots between the most popular TV programmes at peak times and the fact that a growing number of people don’t watch TV ads anymore thanks to digital TV recorders and catch up TV we don’t think that the number of bingo TV adverts is going to increase again any time soon. And while it is not a bingo TV advert, Paddy Power is currently continuing its long tradition with its latest advert for Paddy Power Games. It is catchy, funny, memorable and appealing to a younger generation of player that will be vital to the continued success of any online gaming business in years to come. While online bingo brands will no longer be able to advertise their welcome offers, or may not have an offer worth taking to the TV in the form of a 20 or 30 second advertisement, brand recognition may become more important. This might mean that we will see more sponsorship of television programmes by the bingo sites of TV shows that they feel fit with their demographic. In the past Jeremy Kyle has always been popular with the likes of Foxy Bingo and Cheeky Bingo, but more recently brands have been looking to the popular quiz shows like Tipping Point and The Chase. Even we at WhichBingo have dipped our toe in the water of TV advertising to make the brand an even bigger household name. The ad was made at the height of the bingo TV advertising boom and it seemed appropriate to put ourselves out there as the source of trusted information about all these different online bingo sites that people were being bombarded with on television. Love them or hate them, there is no escaping catchy TV adverts – you’ll eventually be back from making that cup of tea after all! At WhichBingo, we like to keep abreast of how the Online Bingo Brands we review like to speak to the Great British Public and whether the TV adverts we all consume really have any impact on us. 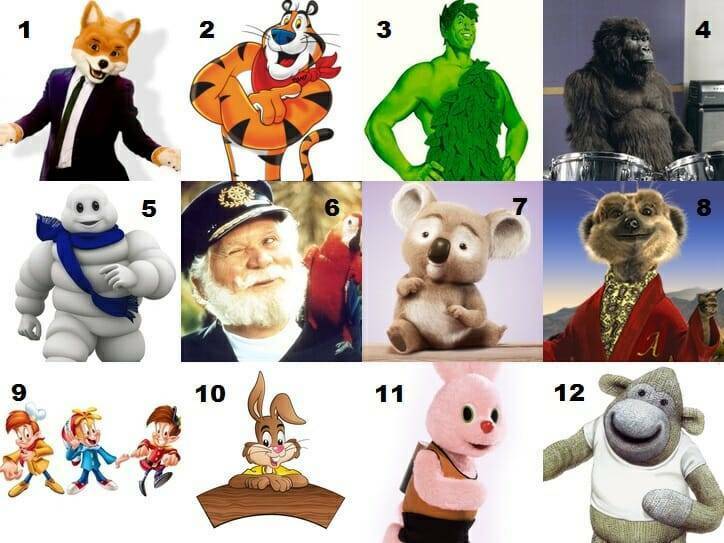 For that reason we created a survey (with a couple of fun questions you can try your hand at below) to see how over a 1000 members of the general public could recall famous adverts and their mascots. Do they really work though? When Barbara Windsor announced she was the Queen of Bingo on the small screen in 2010, we saw an almost 300% increase in the amount of you viewing the JackpotJoy page on whichbingo.co.uk. Quite a coronation if you ask us! There is no denying many of you haven’t just sung those ‘la la’s’ in your head – we can’t help it either! When Gala started showing the adverts in 2014, we saw our Gala on-site traffic grow to almost 5 times what it was only a few months before. The new research carried out by WhichBingo has looked into popular brand logos and slogans and has revealed how many people in the UK can identify the most iconic mascots and catchphrases from advertising. Despite the fact that 41% of UK viewers found that TV advert jingles and catchphrases grabbed their attention, our research has revealed that 60% were unable to match some slogans to a brand. With the average person guessing an impressive 58% of popular brand logos correctly, how well can you answer the same questions below? Below are popular slogans for TV adverts, can you name the brand they represent? 4. What’s the worst that could happen?